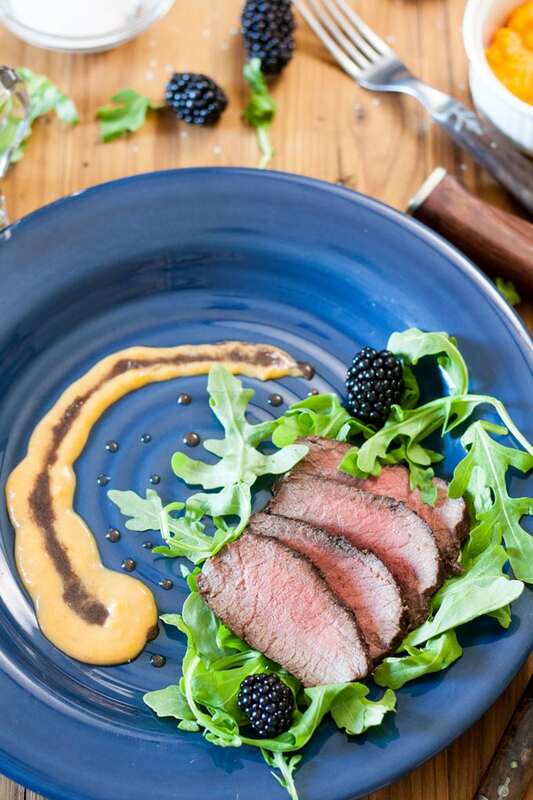 This Venison with Blackberry Sauce is elegant enough for company but easy enough for any weeknight dinner! 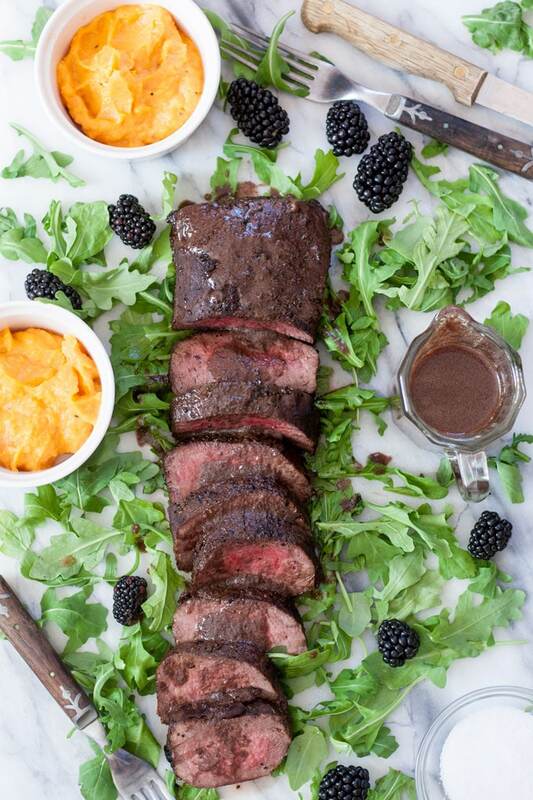 Venison with Blackberry Sauce is also one of the most delicious recipes in my repertoire of Venison Recipes! 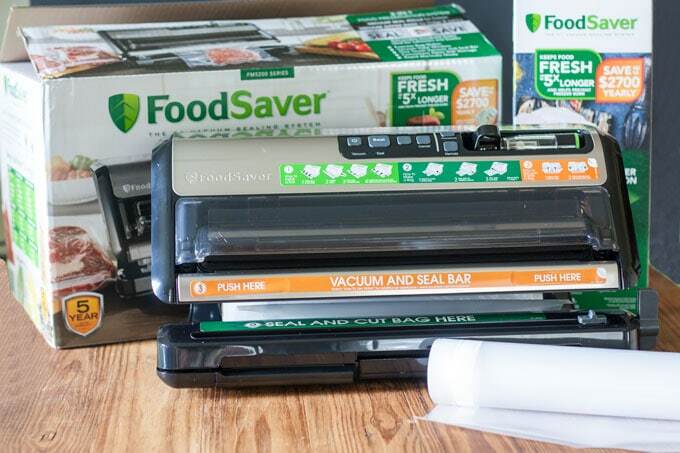 How do I use the FoodSaver® FM5200 and FoodSaver® 11″ x 16′ Vacuum Seal Roll to Make Venison with Blackberry Sauce? Look at how gorgeous this venison loin turned out! Not only is it gorgeous, it is thoroughly tasty! It’s Christmas in September at Binky’s house! Looky what I got! A FoodSaver® FM5200 and FoodSaver® 11″ x 16′ Vacuum Seal Roll! This will come in very handy next month, in particular, but I use my FoodSaver® all year long – To store all of the tomatoes and berries that I showed you this summer, for leftovers, and any other time I freeze or store foods. We have owned FoodSaver® brand vacuum sealing systems for many, many years! I will tell you that every new generation we have purchased has had great improvements over the last. This one, however, is phenominal! The last one we bought was 2 years ago and you had to seal the bags in one spot. This FoodSaver® FM5200, has 2 seperate sealing bars, for the cutting process and the vacuum sealing process. That is going to save me even more time! I am really pretty excited! Cut FoodSaver® 11″ x 16′ Vacuum Seal Roll to the correct length to accomodate your piece of meat. Seal first side in lower sealing spot. Insert meat in bag. Place in the vacuum and seal bar. 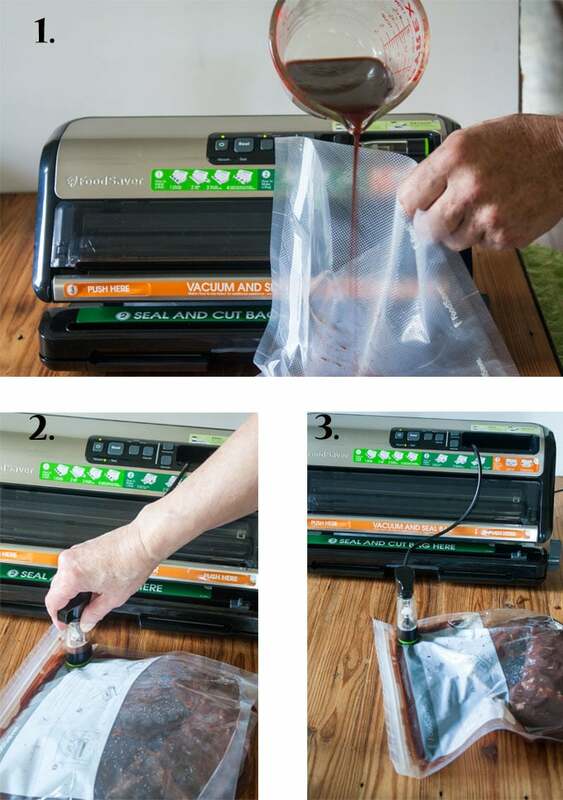 The vacuum will remove all of the air from the bag and then seal it automatically. Identify what is in the bag and the date in the space provided on the bag, with permanent marker. With the help of my FoodSaver® FM5200, this Venison only needs to marinate for about 10 minutes, instead of the hours it would take normally! I also just love the FoodSaver® 11″ x 16′ Rolls. I can take an entire loin for a crowd, or just a few slices for the family because the bags can be cut to whatever length I need to accomodate my portions! That way, I am not wasting large bags for just a few things! Saute shallot in small saucepan, until soft. Add to onions in saucepan. When onions and garlic are soft and fragrant, add red wine and stock. Add whole peppercorns, juniper berry and kosher salt. Get a few sprigs of fresh thyme, sage and rosemary. Add to marinade along with blackberry jam and demi glace. Cook for 15 minutes, or so until reduced by about 1/2. Strain out solids and discard. Cool before adding to meat. Add meat to a marinating bag. Add cooled marinade. Seal the zipper seal and place the end of the retractable handheld sealer over the valve on the bag. Press firmly and press the accessory button to vacuum the air out of the bag. Marinate for about 10 minutes. and proceed with recipe. Remove meat from marinating bag. Pat very dry with paper towel. Generously salt (I use coarse Himalayan Pink Salt) and coarse black pepper all sides of the meat. Sear all sides over medium high heat in cast iron pan, in a bit of high temperature oil. Once seared on all sides. Check internal temperature. We take the venison out at between 125-130°F. Then, tent the meat with foil and let rest for at least 10 minutes. If you are using a very large tenderloin, the meat can be finished in the oven at 350°F. Keep a close eye on the temperature. Venison does not fare well when overcooked! If you’ve been following BCC for any length of time, you know that we love our venison around here! In the years before I had my FoodSaver®, it used to take us days to package all of the deer in the fall. We used freezer paper, so it was so time consuming!. Now that we have the FoodSaver® FM5200, we can package several deer in one evening (We have 3 hunters, with 5 tags per person, lol)! It just saves us a huge amount time! The other advantage the FoodSaver® FM5200 has over freezer paper is that it keeps our venison fresh 5x longer and helps prevent freezer burn. We used venison from last year for this Venison with Blackberry Sauce! It is still perfect, with no freezer burn! Try that with freezer paper! 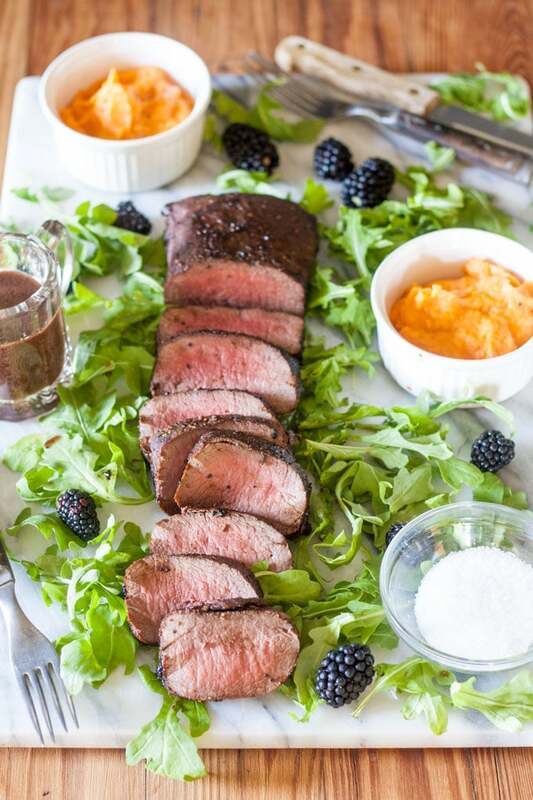 This Venison with Blackberry Sauce is tender, juicy and delicious! The blackberries really add another dimension to the flavor profile! Have you seen the ads for the FoodSaver® FM5200 on TV? It is so easy to use! It’s really a small investment for anyone who hunts and has lots of meat to store for long periods of time. We just served the Venison with Blackberry Sauce with sweet potato puree and steamed broccoli! Such an easy, healthy dinner but also elegant enough for company! Venison is so much healthier for you than beef! It has half of the calories and a small fraction of the fat, as reported in Outdoor Life! FoodSaver® 11″ x 16′ Vacuum Seal Roll, 2 Pack – $15.99 (original price $17.98) – from 9/15 – 12/22, online only! You don’t even have to leave your house! Walmart is so convenient for me, though, that it is a no brainer for me to shop at Walmart, all year, for replacement FoodSaver® 11″ x 16′ Vacuum Seal Rolls, as well! 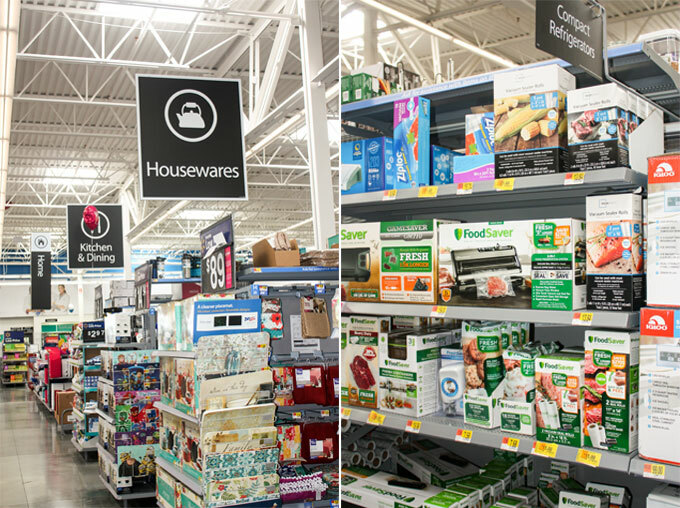 At my local Walmart in Webster NY, the FoodSaver® products are located in the food storage section of the Housewares Department. I hope you enjoyed the recipe today for Venison with Blackberry Sauce! An easy delicious meal for your family! This is the most popular venison recipe on BCC, Venison Sausages, perhaps you may like that one, as well! Don’t forget to sign up for my mailing list so that you don’t miss any new recipes! Thanks for stopping by today! This Venison with Blackberry Sauce is elegant enough for company but easy enough for any weeknight dinner! Venison with Blackberry Sauce is also one of the most delicious recipes in my repitoire of Venison Recipes! Rough chop shallot and garlic. Saute shallot in small saucepan, until soft. Add garlic to onions in saucepan and saute until they are fragrant and have begun to soften. When onions and garlic are soft and fragrant, add red wine and stock. Add whole peppercorns, juniper berry and kosher salt, a few sprigs of fresh thyme, sage and rosemary, blackberry jam and demi glace. Cook for 15 minutes, or so until reduced by about 1/2. Strain out solids and discard. Cool before adding to meat. Once marinade is cool, marinate for 10 minutes in Foodsaver bag, or marinate for 2 hours, if not using the vacuum. Remove loin from marinade and dry very well with paper towel. Place the marinade in a small saucepan and heat to boiling. Turn down to a soft boil for about 10 minutes. Add oil to cast iron skillet and sear all 4 sides of loin. Meat should be 125-130°F. Then remove meat to a platter and tent with foil. Allow to sit for at least 10 minutes, to let juices redistribute! Do not overcook venison! It will get dry and tough very quickly! Wow! I’ve never been brave enough to cook venison at home. You make it look easy and incredibly delicious — I just might have to give this a go! It really is very easy, Sarah! The key is NOT to overcook it! Thanks so much for your comment! How absolutely fun. I’ve got to get one of those foodsavers!! My folks had something similar years ago and I know they loved it! 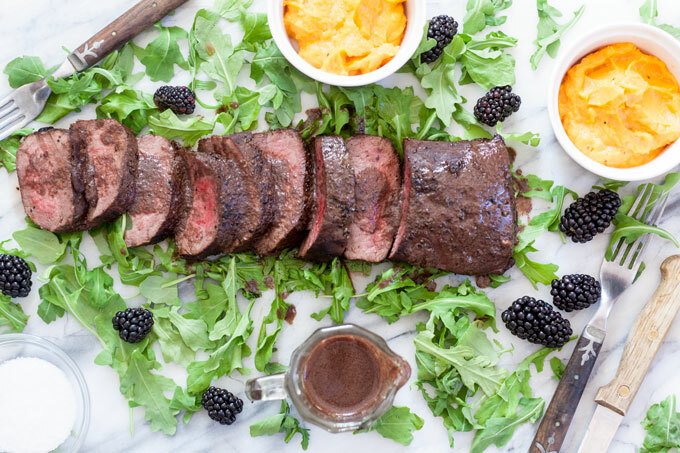 I love venison and this looks so delicious, especially with the blackberry sauce! Thank you so much Elaine! I don’t know what I do without my Foodsaver! It is perfect for keeping my venison fresh! I’d so love one of those food savers. My freezer is full of freezer bags but as you say they don’t always protect the food from freezer burn! Venison is one of my favourite game meats. It’s popular here in Italy. I’ve never made it with blackberry sauce. Sounds divine! The sauce is so delicious with the venison! The Foodsaver is one of my favorite kitchen tools! Thank you Jacqui! What an elegant meal! 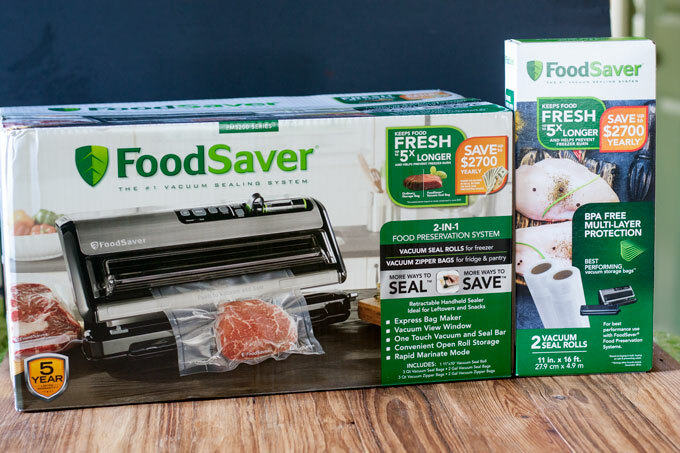 I have always wanted to try a Food Saver – I’ll have to check them out! Thank you Allison! I would be lost without my Foodsaver! They are so great for preserving all of my fresh produce and game meats! This recipe looks so delicious! I’m sure my family would absolutely love this recipe! What lovely photos too! Looks great! Thank you Tania! I really appreciate that! It is super tasty and super easy!! 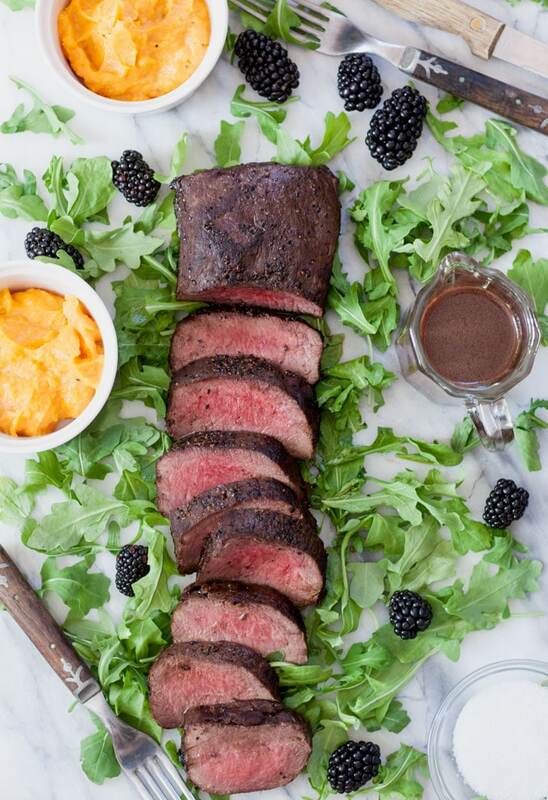 this blackberry sauce sounds like the perfect accompaniment to venison. 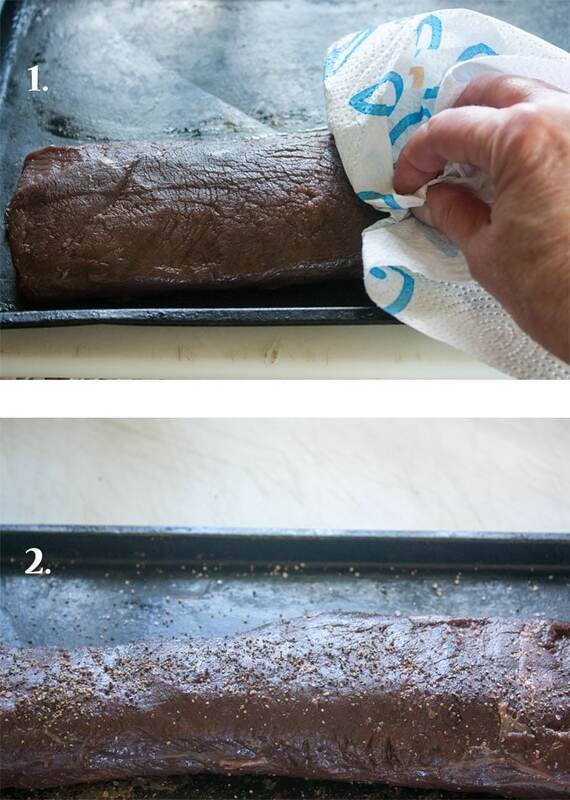 Love how you can shortcut the marinade time with your foodsaver as well. Thank you Courtney! It really pairs well with the venison! I love my foodsaver! Now that looks right up my street, I adore venison and blackberries makes a perfect sauce for it. Cooked to perfection too! Thanks Brian! I knew you would like this one! Have a great weekend! Our family doesn’t hunt but I like to buy meat in bulk and then I always repackage in ziplocs to make smaller portions. Having a Foodsaver would be a great thing to have for our family. Thanks for sharing this find! Yes, I do that, too! It saves so much money, buying things when they are on sale! You definitely need a FoodSaver, Alisa! Thanks! 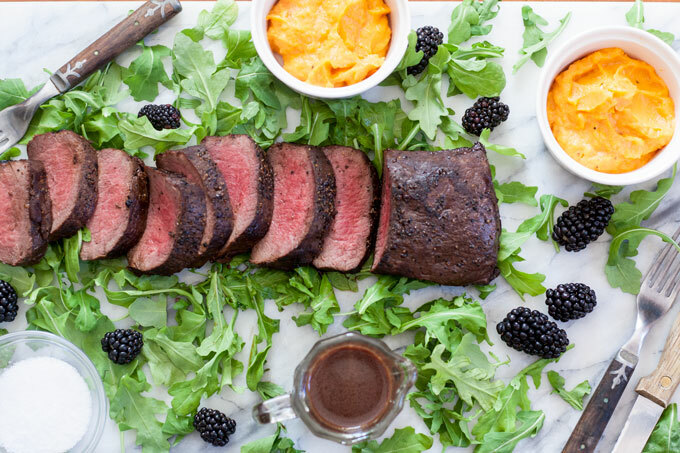 This venison looks so delicious – perfectly tender and super flavorful. It’s very rare that I’ve had the opportunity to eat venison, but I remember liking it quite a bit. I also appreciate the information about the new generation of food savers. We’ve been thinking about getting one because they relaly help cut down on freezer burn when storing meat. Yes, the FoodSaver is a life saver for me! I really love this one now that I have figured out how to utilize the new features properly! It’s awesome! Thanks Jenni! 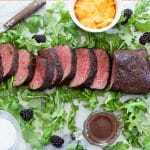 I have not cooked venison at home yet but boy, I want it badly now after seeing this deliciousness – I am drooling badly over here – great recipe Beth, thank you for the inspiration and for the recipe. Haha! Thanks so much Ramona! I’m glad you like it! Have a great weekend! !